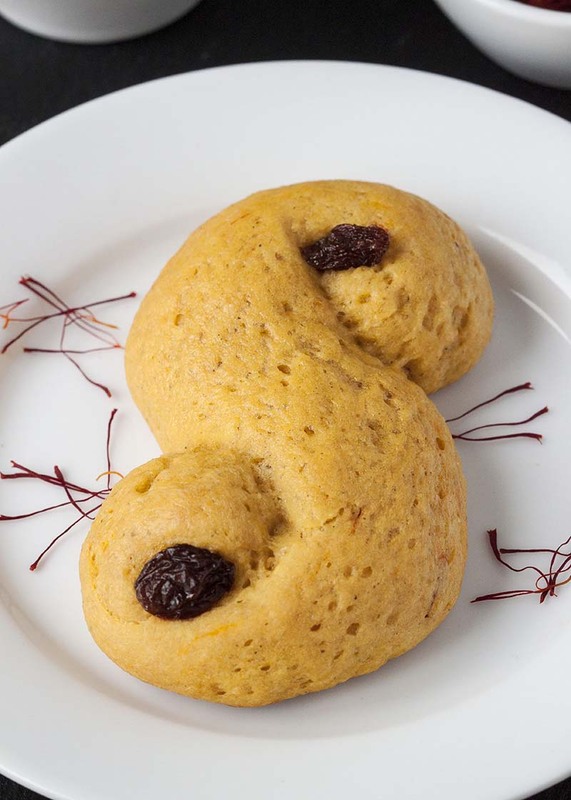 These soft saffron buns are 100% whole grain and are traditionally eaten in Sweden on St. Lucia Day and throughout December. In the bowl of a stand mixer, stir together 2 cups white whole wheat flour, potato flour, vital wheat gluten, sugar, ground cardamom, salt and yeast. Set aside. Mix together the milk, water and saffron threads in a small saucepan over medium heat. Cook, stirring frequently, until the mixture is hot and steamy, but not yet simmering. The mixture should turn quite orange-yellow. Remove from the heat and stir in the butter. Stir until completely melted. Let cool to between 120-130°F (49-54°C) and then add the milk mixture to the dry ingredients, along with the eggs. Use a silicone spatula to stir until well combined. It may be quite dry and crumbly at the beginning but should eventually become wet and smooth. Using a stand mixer fitted with the dough hook, add 1 cup of the remaining white whole wheat flour, ¼ cup at a time, while mixing at the lowest speed. Fully incorporate the flour before adding more. The dough should still be quite sticky and won't pull away from the sides of the bowl. Knead on low for 5 minutes. The dough will still be a little sticky and won't completely pull away from the sides of the bowl. When you touch it, it should stick to your finger just a little bit. If it's still very sticky, add up to ½ cup more flour, a tablespoon at a time, until no longer very sticky. If adding more flour, knead for another 2 minutes on low. Using a silicone spatula, scoop the dough into a lightly oiled mixing bowl and cover the bowl with plastic wrap or a tea towel. Punch the dough down. Turn dough out onto a lightly floured surface. Prepare 2 baking sheets with silicone mats or parchment paper. Divide the dough into 24 pieces (40g each) and roll each piece into a 7-inch rope. Form an S-shape and place on the prepared baking sheet. Repeat with the remaining dough, leaving about 3 inches between each bun as they spread quite a bit. Cover the baking sheet with lightly oiled plastic wrap and place in a warm place to rise for 30 - 45 minutes or until doubled. Once they've almost doubled, preheat the oven to 350°F (175°C). Brush the egg wash over the buns and place one raisin on each end of the buns. Bake the buns for 8-11 minutes or until lightly browned on top. Serve immediately, or cool completely before storing in an airtight container. Can be kept at room temperature for up to 5 days. Reheat in the microwave at 50% power for 10-20 seconds or until soft and warm. *Refined coconut oil was used, which has no coconut taste. If you use unrefined coconut oil, these are likely to have a coconut taste to them.